The official Climate Week (21-27 March) t-shirt has been unveiled featuring an exclusive, limited edition design by the ‘patron saints of print’, Eley Kishimoto, in aid of the Environmental Justice Foundation. 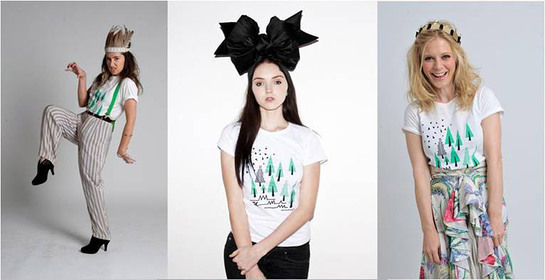 A host of talent has stepped up to front the on-trend geometric print, including EJF Patron Emilia Fox, Lily Cole, KT Tunstall, Jade Parfitt, Gillian Anderson, Eliza Doolittle, James Blunt, Jemma Kidd and many others, making it the fashion world’s t-shirt of choice. Organic, ethically made, and manufactured by wind and solar power, the low carbon t-shirts will be available for men and women in time for Climate Week for only £10. Available from Tesco in store and online at www.tesco.com/clothing and EJF’s web store. Shoppers can do their bit to reduce the carbon footprint of the t-shirts even further, by washing it at a low temperature and hanging it up to dry. The Climate Week t-shirts will be available in store and online at www.tesco.com/clothing in time for Climate Week for only £10. 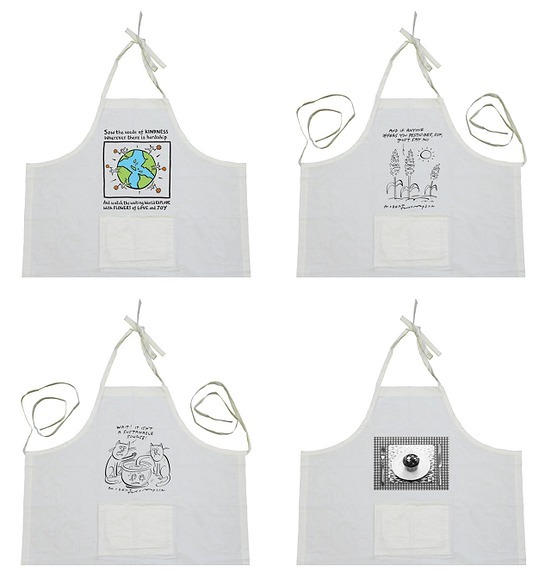 EJF is also proud to announce that some top illustrators and cartoonists have created fun limited edition ethical aprons to raise money for charity. Traditionally known for being the heart of the home, the kitchen is increasingly becoming a key symbol for campaigners concerned about sustainable seafood and organic farming. The charity has created an apron for everybody; Giles Andre, aka Edward Monkton, creator of the Pig of Happiness and Purple Ronnie has styled his apron with the same playful philosophy that can be seen in his other works. While Robert Thompson’s classic cartoons will appeal to foodies and animal lovers alike. The beautiful unisex aprons are made to the highest Earth Positive standards, using only the finest quality organic cotton and manufactured with the use of wind and solar energy. In addition, the aprons carry certifications from the Soil Association, Global Organic Textile Standard, FairWear Foundation and a carbon reduction Earth Positive label. Available exclusively at Whole Foods Market from March 5, £5 from the sale of each apron will directly help EJF and their grassroots partners to tackle the root cause of environmental destruction and promote peaceful solutions for the future. 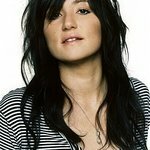 Tommi Miers, star of Channel 4 series Wild Gourmets and former Masterchef winner, has also got behind the campaign, transforming one of her favourite recipes into an organic and fair trade masterpiece. The delicious recipe will be exclusively tucked into the pockets of each apron.